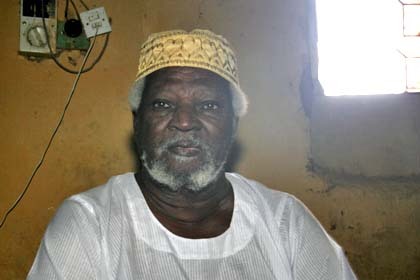 Philip Abbas Ghabush, known to many people as Father Philip, is the most senior Nuba politician still around. His political history predates Sudan's independence. He used to work together with the SPLM/A, but now he is very disappointed. In a long interview he talks about his life, about the ties between him and the SPLA, and about his present political activities. I have so many titles, but most people call me Father Philip. Actually I am not a father, I'm an arch bishop and in the army I'm a field marshal of the SPLA/SPLM. Well, that's a joke of course - but I should be anyway. I'm coming from a royal family in my country, from both sides. I am from the Ama tribe. Not from the Nyimang as some say, but from the Ama, the most fierce people in the moon. We're totally terrible, huh? Yes, I'm coming from the Ama. I was born in 1922, here in Umdurman. My father was in the British Army. Even I was recruited by the British Army to be trained. It was customary that the children of the officers and soldiers were trained also. Early morning, evening late! I was brought up here in Umdurman but later when things went wrong we had to escape to the Nuba Mountains. There was this 'jumble of 1924': our people fought, they wanted to overthrow the British government and drive them away so that they could have their independence. But it was crushed and most of the people quit and went to their areas, so I was taken to my original home: the Nuba Mountains. Later I became steady, so I went to Katcha intermediate school. There were not so many schools at the time, there were only two high schools: the one in Katcha, and Daluka intermediate school in the South. It was a real problem. In 1952 I went to the South to study Theology. It was the highest school we could go to - in fact it was the only college that had four years. Did you go out of religious conviction? I don't know, well, we had to award them sometimes. I remember I went around to preach at the colleges, the bush colleges. We used to preach there daily. So many areas, we went even to Rumbek and from there to the many villages around Rumbek. It was part of my education. I used to train small pastors. I was ahead of them so I had to take them from area to area. At that time, for the first time ever in Southern Sudan, we went on strike against the British Government. The first time our people protested. We had these very old chiefs there and they came to calm us down. They said "don't do it, or the British Governor will send the army, and the army will torture you and let you suffer. Don't you do it!" So we stopped it. That was the first political movement ever in the South. It started like that, early in the fifties. The British Governor was so angry with us. He came and talked to our principle: "What are you trying to make? You have some devils here with you!" Well, I was stubborn of course and never mind: this thing went over, but only briefly. When [Ismail al] Azhari, the first head of Sudan, came to the South, there was a lot of rubble there. The people were so unhappy, they didn't like him. It was so bad that we had to hide him in our school and calm him down. He never came back to Southern Sudan. I stayed there for four years and then the war broke in. Later I went to finish my study at Bishop Gwynne College of Theology - which was renamed to Gordon Memorial College after the first year I had there. From there I went to Kenya were I took an administration course at the Trinity College. This is the line of my studies. In my life I met so many difficulties. When I came to my area after finishing my education, I was tempted: I was offered many good posts in the government. But I used to refuse. I said 'I have to evangelize my people', and I started evangelizing them. Then later, the lion took me on to live this political life. Why did you become involved in politics in the first place? Injustices! A lot of injustices; in the Nuba Mountains especially. I know it very well: this is my land. There were many things they did, the Sudan governments. Governments: not only one. In all their history - no, no, no, no: the Nuba people were just back, back, back; always back. Although the governments took a lot of money from us and built this Khartoum and so on, they did nothing for us. Education is a very good thing, and I used to travel many areas; seeing, investigating: what is going on in the world? And then I decided: 'well, I'll do my religious work and at the same time I have to rescue my people'. And that's why I formed a little army, a body, and took them to Anya Nya I. What is the meaning of your life when you see your people being treated badly - not even considered as human beings? They treated them as if they are animals. Such villains: they are like a man too sick for rescue. This is what I felt. Not only my Nuba people, but also Southern Sudan. The Southern Sudan was just regarded as something very belligerent and something very nasty. I told many people that the British colonization destroyed the Sudan African people; destroyed them completely. Not a single good thing they did; nothing. I am sorry to say that, but really: they did no good at all. And that is why Southerners are so unreasonable. So the injustices made me to come to politics. I was very smart; at sixteen years I already was a politician. I started in 1938. I suffered a lot of arrests in Kadugli, in where, in where, in Dilling, in El Obeid. I liked to be on the move internationally and locally. I was deeply interested; I read quite a lot of books. I made a lot of friends in Africa. I went to South Africa very early and I saw that Apartheid at work. I was sooooo, so angry. At that time my friend Mandela was in prison, as a lawyer. He was in prison but I met a few of the [ANC members]. I was very fortunate: a gentleman took me there and we went to Soweto. It was the worst place I have seen in my life. I have learned from this world a lot. Were you the first politician from the Nuba Mountains? Not the first, but I was a real rebel. Not a politician only: I was about to take arms! Yes! I and my friend - the SPLA has forgotten the poor man - uncle Clement. We planned a mutiny together. I had a few arms in the Nuba Mountains, and I told him: you start from that corner, I start from here. But then the first Anya Nya was so quick: they started from Torit. I was there, when the Torit problem started. It was awful. The Torit group did very well. At some point there wasn't an Arab there at all. They finished them all; killed them all. No Arabs in Southern Sudan. At that time, if they had wanted to, they could have established their government. It was not easy to see: they were so slack. And later the thing turned against them again.
. very bad. These were my experiences in Southern Sudan. I was regarded as one of them. Anyhow, this is how we started the mutiny. I took the first boys to Anya Nya I, Brave boys, very brave boys. You did form the first Nuba political party: the General Union of Nuba. This Nuba Union is an acute thing, and very difficult to understand because you don't know how it was formed. You cannot imagine: within three months the whole Nuba people were standing as a pillar: one pillar. Just three months! [It happened] because we had a need to be one. We had these poll taxes: you had to pay some sixty piaster a year. We didn't have that [money] and people revolted: the whole Nuba Mountains people. By then I was a young man coming straight from college; my mind full because I read a lot of books; confused completely. I started with a few people. We started thinking: 'what are we going to do,' our people said. 'We don't want this poll tax and what not and what not.' So we sat down in Kadugli and formed this Nuba Union. GUN it was called [General Union of Nuba]. Slavery! And openly we said: 'this is slavery! For how long are we going to be slaves and still pay this money?' we agreed unanimously that we should do our level best to bash out this thing. Okay! Well of course the Nuba Union came from very many people. Educated, uneducated, farmers - what not: a real revolution. And that's why we took these drastic measures, that we must kill this dikniya. We were hoeing the city roads for nothing. We had our best cotton, American cotton, and they were paying us less than any - so many things. We put it as a program and we did it. The Nuba Union was lucky to have all these chances and to try to implement a lot of things for the Nuba. Nowadays the Nuba people don't know anything about this. Sometimes they hear about it but they have no idea how we did it. We didn't have any means. You know what we used to do? We begged. In our rallies we had a little act, we begged, so tarifa. "Girrish," we would say, and this was how we managed really to win the elections. And not only this battle. Our people were so keen, so keen to support this Nuba Union so that their wishes were represented. Strange enough, we didn't have any means to gain - to have some money; we just didn't have it. When someone has something in his heart and wants really to do something, he can do it. The Union did a lot for the Nuba People. Especially that heavy burden upon them: we relieved it. We had some very nice members, we even had several people in university who helped the Union very much. Collecting some money and making rallies, and the thing became very big. That is how we had to win the election: eight in the first one: eight members! And when we came to the Assembly we were hot as fire! Because if you don't talk, they don't hear you. We were very hot. We had the Sudanese journals talk about GUN and about the Bija people because I brought them together. We became sixteen people and we were working very hard. Hahaha. We were working harder than the bees and we were able to [get rid of the poll tax]. I am now seeking for the same thing but I don't know whether we are going to get it. If the people will give us a lot of constituencies we will win more than thirty seats. I wish so. You said you sent Nuba recruits to Anya Nya I? I led them, yes. I led them to Anya Nya I. But before that I worked with the Southerners. Later on I led a lot of them out, especially my young people from Tira and Otoro and Moro. Those were the first soldiers. I led them. Quite a number - not very big, but they did very well. Were you involved in the Komolo? I was in Kenya with the party of Jomo Kenyatta. I arranged for them some of the areas and we did quite a lot as Komolo in Kenya. I thought it was a good idea to unify the Nuba, so I took some people - there were Joseph and [Adam]. We swore together here, we swore Komolo here, before they went out. Yousif Kuwa, Abdelaziz [Adam al Hilo]: they were the first people I recruited, here in this house. Then of course they led the whole thing. Komolo was a kind of baptism: it is blood, water and salt. We came I a circle like that, I made a cut in every person's hand. I was the doctor. Then they washed the hand in water with salt and then all of us we drank it, from one cup. This is the Komolo. Komolo grew up until it became very famous in Sudan. Sometimes we sat here with ten people. I would do the same thing, and we sipped from the cup until we finished it all. It was a very bad custom. We had words that you had to say; the men swore; we had secret words. You had to swear and this way I was able to tie most of the Nuba to me. No, no, no, I can't tell you the words. I can give you the outside, but not the inside, oh no, thank you. Because, you see, we have the time coming. Most of the SPLA people are from this Komolo. Ibrahim Bellendia told me there are many members of Komolo who joined the NCP; he himself is one of them. How is it possible that the Komolo members moved in such opposite directions? I refused all offers. I have not reached my goals yet and I cannot run after money. No. Our people are still very primitive. We need to have the young men with us. I can't walk outside anymore. Before I used to go house to house and invite young people to come to me here, but now I cannot; I'm becoming so old. And when they come now, they want to become rich quickly, they want to have money quickly, they want to become ministers quickly. Years ago, a young man came to me. There were elections in Kadugli. This young man came to me and he said: "Father, I would like to be in the party but you don't have money"
This is my experience. I have the man power - but if you want to go and follow the money: you go! The people in the SPLM do the same thing! But let them be. They are mine. I know how to bring them back. By your strong face you can convince people and by strong talk, and by words that are full of wisdom you can help people to understand. No, those who are in the SPLM, they are mine, I don't care. Let them see, let them enjoy; later on they will come. I recruited all the young men that went to the SPLA - with a few exceptions. The front started a bit feeble, but later on, when John [Garang] came, it became very strong. And this is how we had the link with the Southern Sudan. Thanks to our boys. I appreciate what they have done at Bor, with my son John Garang. I appreciate it; my young men - they fought, but they came out without any benefit. Sorry. I have to tell you that I am not happy with the SPLA. They really neglected us and they threw us out without any benefit. Although I have worked with them all my life, fighting with them; my young people fighting with them: they never gave us anything. I feel grief, al lot of grief about that. Anyhow, we recruited many of them as Komolo, even the late Yousif Kuwa, and we sent him and other friends of his. This governor now in Kadugli [Ismael Khamis Jelab]: he's one of them. We came from trying to stage a coup and we were caught red handed. We were caught red handed, but later of course we said it was better to send these young people [to Ethiopia] to be trained and to come back to fight. We fought a good fight - but we got nothing. A trick was made; again. Before, with Anya Nya I, the same trick was made to me. You see, they sent me on duty to an area, and then they went to their Round Table Conference in Addis Ababa. I was supposed to go there too; I was from the Jumbe of Zaire: very bad people; strong people; strong front there - and then they cheated me. They said: "you have to go on duty." So then people went so quickly; I became very irritable and very angry. These are the tactics of the Southern Sudanese people. I am not happy with them. I tell you frankly - I speak for my people: we are not happy. And this is the second time. In Naivasha people were negotiating and our boys they were there. They sent them out and told them 'you go and have your breakfast'. They went to take their breakfast; when they came back, they had already deluded out Nuba Mountains, Ingassana and Abyei. Deluded them out in one day. They said 'we have finished.' 'What?! You told us to go for breakfast; what is happening?' They said 'no, no, no; finished.' And thus we were killed completely: spiritually and physically we were killed. Nuba people, our people, are very angry now. Pressure. I came. I had wanted to come back here, because I have to put them on fire. Abdelaziz now has sought refuge in America; he's not coming back and he's not trying to come and face me! Because he was very, very feeble and very weak before our brothers in the South. What would you have wanted for the Nuba people? In all the conferences we were very clear; even when I went to Rumbek I was very clear: we want complete self-determination. And this was also the call of Yousif Kuwa. Up to now this is our call: we want our own government. Enough is enough. We don't want Southerners, we don't want Northerners. We don't need them, because we have a lot of educated boys and girls; we don't need anybody. We want our own government. And now we're weary, very weary. Suppose the Southerners secede: where are we going to be? Legally we are Northerners, but we cannot go with them, we are very different people. We know them; the Nuba know them very well indeed. Two times we have been cheated by our brothers, but next time we cannot be cheated. Starting from now, we have to stand alone; we have done enough for other people. We helped our army and even our educated boys, they are helping these bloody hell people here - but we found nothing. I'm encouraging the young men to stand on their own feet; this is what we have to go for. We have the powers, we have young people who are talented and strong. And they are very sorry. They came to me and they told me: "we are very sorry baba, we came out without any benefit." We want our own government in the Nuba Mountains. The National Sudan Party, yes. At the moment I am the only one in the National Assembly, but we almost have El Obeid in our hands because our boy there is doing very nicely. We need two things: education and some coins for them to live only. But education is number one. We ask all the foreign organizations to help us in education and especially helping our organization. We need some transportation, some cars, to let us move quickly. You go to meetings, to rallies. The other day you should have been there, we had a very strong rally in my constituency of Hadj Yusif. We did it on foot. SPLA/SPLM, yes! There is a dialogue, but I have to tell you: Kadugli is not for the SPLM. No! Nor for that other party [the NCP]; it is our area! There have always been about fourteen constituencies, and most of them, eight, I used to bring in for my party. So that area is not for them. I haven't come to the Nuba Mountains yet, but when I come, I will jumble everything. They cannot take our area: forbidden! Our own people are very strong, I've got strong families there; they are very serious, and they have visited me. They came and invited me and I thank them very much indeed. They honored me and therefore I am not afraid of what might happen at the elections. are you sure? Are you sure that the elections are going to come? We have to work hard during these three years; we have to work hard ourselves. We wish to have more members in the assembly next time, when the elections come; more men and women to stand for the election. We will bring them whether they are SPLA; they are what: we are the party that used to have the majority in our area. And this is what we are working for now: this is our plan. Is there common ground between the SPLM and National Sudan Party? I can say this now, because in fact we're trying to weigh and balance [our positions], but we've started; we've already done the first step. Just recently, I sent Adam and the other young people there. As I told you I sent Ismael [Khamis] himself from this house. Made him a Komolo and sent him. He knows the thing went very well indeed: he's a head of the SPLM now. I think he has to make up his mind; he has to make up his mind about how he wants to lead the Nuba people. Yes. They are my people, but they are very difficult people. Nuba people: you have to talk to them straight, especially to become their leader: you must go straight. And they are very quick to notice things wrong. Very difficult: you have to be careful with them. What the future will bring, nobody knows. You have been in exile many times - was it out of fear for your life? how many times? So many times. I went in exile, I came back, so many times. God is with me: nothing ever happened to me. I just came out of exile very recently; I was in the United States for two years and I learned quite a lot. I always tell people that I learn from the street. My universities are treets and people; ordinary people. I made a lot discourses and political rallies during these two years. I also went to the United Nations to represent the Nuba. I am not a Southerner, I am not a Northerner: I am a Nuba. So I put our case up there. Unfortunately I didn't meet Kofi Annan, but I didn't go in vain: I met his deputy. He's a British man. He came to Sudan and he meant to talk to [President Omar el] Bashir very strongly - I am very happy with that British man. they are not Johns. I don't know about the South because I haven't been there up to now, but those I see here [in Khartoum] - some of them are not Johns. Sorry. He was a good son of mine, and he worked with Yousif Kuwa very well indeed; and worked with me also very well indeed. But unfortunately, what is happening now was completely not his vision. What is the difference between his vision and what is happening now? John had that unique vision, and he also had a good talent to select people. Not just sambala -the Southerners say sambala: anybody coming in. Some of the [ministers from the South] didn't even fight, didn't do anything until [the SPLM] brought them now to sit on the highest chairs [in Khartoum]. To me, the war has not ended. The day John was buried, everything has gone with him. The war is stalking behind, coming; there are many people getting alert. Even our Nubians in the north North are becoming very alert now. And the Easterners: Fuzzy Wuzzies - you know them: Fuzzy Wuzzies? - even they are becoming alert. So the war has not ended, whatever we say about peace. To me, there is nothing called peace. But we're maneuvering for it. How do you hope to bring it about? I have always had some kind of strategic political life. I planned to join the so-called backward areas. I started first with the Southern Sudan and then went on to the Nuba Mountains. From there I went to he East and then to the West: extreme Darfur. And then I went to the extreme North to the Nubians there. And now we have put the Arab government in a circle, inside, and we need to work hard. This was my plan and I have completed it. Just before the Darfurians rose I was in this conference with John, in the US. I told him: "the Darfurians were calling me there, but suppose I would have gone: I could not come to the South. If I would have gotten involved, I couldn't have gone to Southern Sudan." He said: "what?!" I said: "yes; in just two days, three days you will hear." It was now that the mutiny in Darfur started. And they came and met us there. "This is something," I said, "we were five regions, now we're six - and the seventh is also coming." And it happened. It upset us completely. Some people are hesitant to speak about these things but we are not. The SPLM/SPLA is no longer a movement that people are standing with. No, no, no. They're a party now. And as with any party, we have to sit together and work out how we are going to work with each other. What is going to happen in the elections, what is the future life of our children, our young people and so on. We have to do this, just do it, otherwise pfrrrrrrt! things will fall apart. This is my vision: we have to sit down. Our young boys killed in the South; nobody in the South killed for us. Some of the leaders instigated people and completely dashed and killed our young people. I am very bitter about it. And they are now enjoying their share in the government. Hmmmm?! They killed our people like anything. And this cannot go out from me. I'm very sorry. They killed our boys all and later deceived them and sent us out without giving us a single thing. All this 45 [%] what, what. Pfrrrrt! We could not have the quorum! We could not have the quorum to take things in our own hands. But let them! Our blood is on them. Let them take the money! Since I came back [from the US] nobody from the SPLA came here to visit me. And I myself, I am SPLA! I am a member, and I am their father. They should have come. But nobody from the SPLA came to visit me, to say 'we're happy you came'. They're all in Khartoum here! I'm disgusted. Anyhow, this is exactly the thing that is happening here. Let them help themselves now, and try to come out of this agreement they made, this loose and ever looser agreement. Let them enjoy it, we're not there. They have not given us anything. They came and took this very young girl. They came and took it from me; they gave her whatever, they made her a minister - this is not the thing we wanted. What do you consider your biggest achievement? My achievement is that Southern Sudan is going to be free. That is the first achievement that I'm happy about. And I hope soon [the Southerners] quit from Khartoum and go all to the South and pronounce their government. If this could be done it would be a big achievement for me. And for the Nubas? Ha! As I told you, we must prepare ourselves to announce our government as we like it. Very, very soon - or later.